The Vikings use a well-rounded attack to take three of four tightly-contested sets from the Jags. With both teams riding losing streaks, Century having dropped two straight and Forest Grove on the wrong end of three consecutive games, the Jaguars and Vikings volleyball teams met in a Pacific Conference battle Wednesday, Sept. 12, at Forest Grove High, desperately seeking to turn the tide. And the home team did just that. Forest Grove, on the backs of a balanced attack, won three straight sets after dropping the first en route to a 25-27, 25-22, 25-19, and 25-22, four-set victory over the visiting Jags to end their three-game losing streak and collect their first win in the first-year Pacific Conference. "Very nice to get our first league win, and I'm excited for the future," said Forest Grove head coach Amber Lieb. "Century is a good team. They're scrappy, have good servers and good blocking, so we had to work for it." After losing the match's first set despite a 24-21 lead, the Vikings kept their composure and battled their way to victory in three straight tightly contested sets, to close the door on their first conference win of the year. "I was proud to see the girls fight," Lieb said. "In the past couple years we've gotten down on ourselves and given up too early, so I was proud to see them fighting for every point and not looking at the scoreboard. They knew what they needed to do and they did it." And they did so as a group. 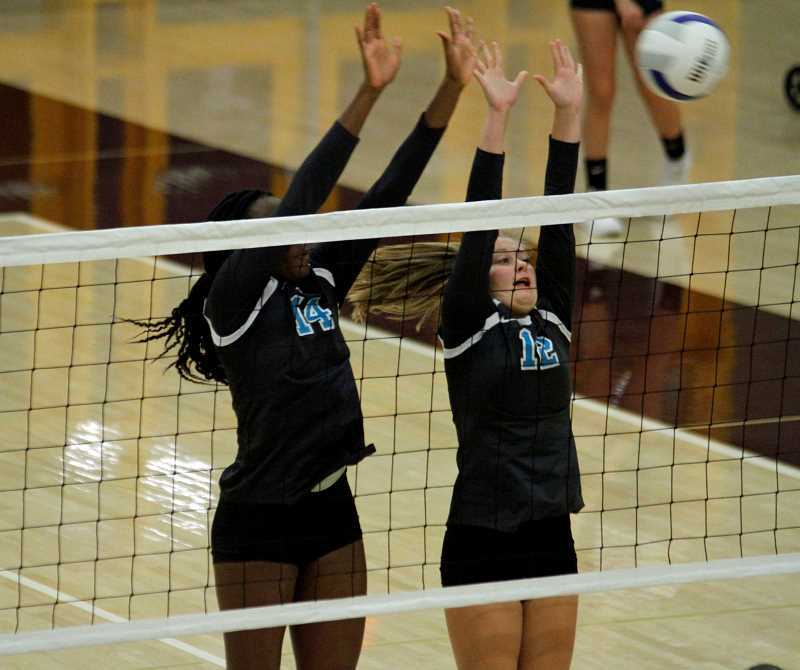 Led by the attacking and serving prowess of juniors Jacquelyn Fipps and Olivia Grosse, coupled with the blocking of sophomore middle blocker Amanda Rebsom, the Vikings scratched and clawed their way to points against a group of seasoned Jaguar netters. "The girls came out tonight and just wanted the win and they worked for it," said Lieb. "Lots of good communication and lots of good teamwork, which made my job a little easier tonight. They were great teammates." Lieb also pointed-out the difference that a growing talent like Rebsom can make at the net defensively, not just in this specific game, but going forward as the team and season progress. "Amanda Rebsom was amazing and has really gotten a taste for blocking, and she wants it," said the coach. "Almost too much, so we have to keep her out of the net. But I'm excited to see that hunger and want for it." In addition to the aforementioned, Lieb was happy with the performance of senior defensive specialist Elena Sanchez, who was filling in due to injury. The coach said Sanchez did a nice job passing for the Viks, despite not being entirely comfortable in that role. Lieb did however cite the team's serving struggles as an issue early-on, but also pointed out their ability to clean up a series of unforced errors as a turning point in the match. "As you probably saw, we struggled a bit with our serving," said the coach. "But we were good about reducing our unforced errors and that really helped us in those close sets." Century, on the other hand, will be kicking themselves in the wake of the defeat. 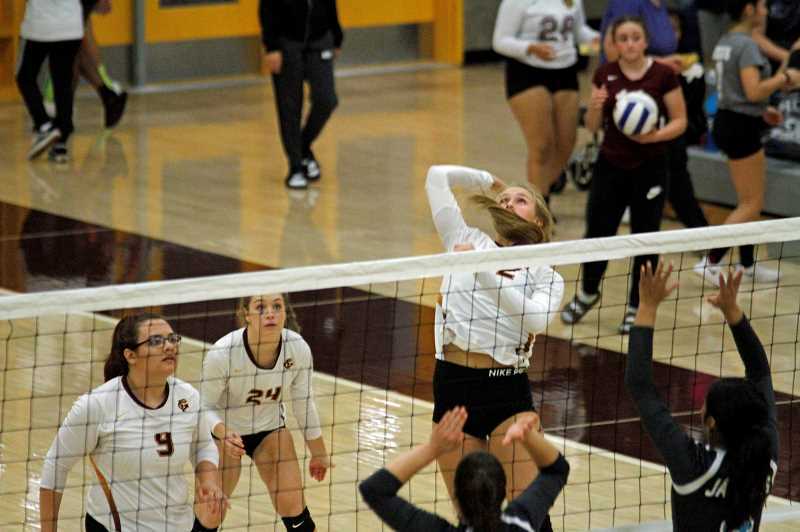 After taking the first set 27-25, they led 22-21 in the second set, trailed by just two 18-16 in the third, and led by as many as seven in the fourth before losing six straight points and 14 of the next 17 as Forest Grove ended the match, along with their three-game losing streak. "It was a good win and we're improving not only with our volleyball skill, but coming together as a team," Lieb said. "Some girls haven't played together much and that just comes with repetition. I'm excited to watch this team continue to grow." With the win, Forest Grove improved to 1-2 in conference and 5-4 overall. Despite the loss, the Jaguars got a strong performance from a pair of sophomores, outside hitter Milan Hoopes and middle blocker Barakat Rahmon, who tallied more than a handful of blocks as part of an inspired Century effort. Century is now 2-6 overall, with a 1-3 record in conference.